Do you carry a heavy purse on one shoulder? Commute to work, only to spend eight hours sitting at a desk? Cross your legs when you sit? Carry your child on one hip? Hold the phone to your shoulder with your ear? Whether we realize it or not, every action we take in our daily life – big or small – has an impact on the way our physical body functions. And over time, any stress on our bodies creates an imbalance that could sap us of strength and energy. For some, an imbalance may result in nagging muscle aches or pains; for others, it may manifest in a chronic condition. In your mind, walk through your typical daily activities – from getting out of bed in the morning to going to bed at night. Visualize the way you’re standing when you brush your teeth, the way you sit at your desk, talk on the phone, eat your lunch, play with your kids, sit on the couch, even your workout regime. You might be surprised at how many activities you engage in that create imbalances or put negative stress on your body. Brainstorm some ways to combat these imbalances. For example, if you drive long distances or sit at a desk all day, schedule stretch breaks where you can counteract the stresses of sitting with gentle back bends and some neck and shoulder stretches. 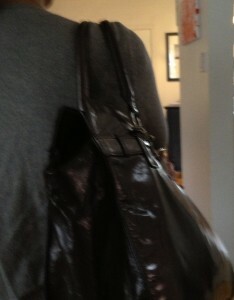 Or if you carry your purse on one shoulder, try to be conscious of switching arms as much as possible. In the morning, at lunchtime, and in the evening, perform a “check-in” with the body. Here’s how to do it: Get out of that office chair and rise to a standing position. Direct your attention to each body part and notice if there are any areas of tension, pain or discomfort. See if you can trace this discomfort back to an action or activity (large or small) that you recently engaged in. Once you have a focused awareness of your body tension(s), perform some gentle but targeted stretches to release tightness in the muscles. The more time we spend connecting our minds with our bodies, the more likely we are to catch and stave off negative stress before it creates strain on our muscles or joints. Incorporate regular bodywork into your life. Just as cars need regular maintenance, so do our bodies. Making an appointment to spend time working on your body increases your awareness of your physical habits and their effects. Whether it’s in the form of a monthly massage, a weekly yoga class, or a daily guided relaxation, bodywork is a fantastic way to maintain and nourish a healthy, balanced body. And as an added bonus, your mind will feel refreshed as well. So, as you head off into the rest of your day, bring a greater awareness to everything you do. You might be surprised at the results. A version of this post originally appeared on January 11, 2011 in my weekly health and wellness column over at That’sFit.ca (no longer in publication).